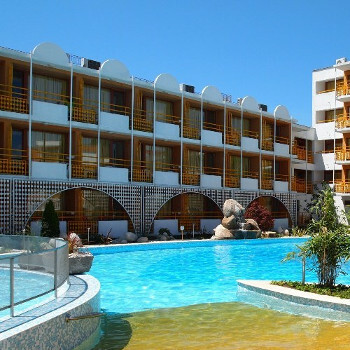 Formerly known as the Sozopol/Nessebur hotel, it was fully refurbished couple of years ago. The Nessebur Beach is located in the southern part of the resort, a pleasant 10 minute walk from the lively centre and just 50 metres from the beach. We stayed in the Hotel Nessebar Beach, in Sunny Beach, Bulgaria. The hotel was really well looked after and clean. Rooms were cleaned daily by the maids, providing clean towels whenever needed. The swimming pool was lovely and although the Germans reserved there sunbeds we always managed to get the 6 beds we needed. There was a sign saying NO RESERVATIONS of SUNBEDS and one morning we witnessed the staff removing all the towels from the sunbeds. From that point on we made sure we stayed with our sunbeds till 9, then went and had breakfast. The entertainments team put on various pool activites including water aerobics and water volleyball. Although Bulgaria doesnt seem to be attracting that many Enligh at the moment, most of the hotel staff spoke a reasonable degree of English. The childrens entertainment was mostly done in German or Bulgarian but i think there may have only been three English families in the whole hotel. There wasnt much in the way of evening entertainment for adults in the hotel which was a bit disappointing as we were all inclusive and enjoyed drinking in there bar even if the local spirits drinks were extremely strong. Saying this the bar staff were happy to give smaller measrues for the non-hard-core drinkers like myself. The buffet style food was good. Although some things looked a bit strange, most was labelled and tasted quite good. There was always plenty of salads and anti-pasta. Breakfast wasnt a typical 'English Breakfast' but close to it with fried eggs, fried bread, sausages, tomatoes etc. There was always cereal, yoghurts, breads and various 'cakes' too aswell as teas, coffees, juice etc. For Lunch and Dinner there was always a selection of meat cooked in various ways, two types of pasta and sauces, choice of potato's including chips at lunch time. The desserts were various cakes, which were fab, ice creams and fruits especially melon! One lunch time i think we saw them bring out ten huge water melons in the space of half an hour. There were three restuarants which could have been booked to eat in. We didnt do this becuase you had to order your food the day before and we did see as we walked past one night peoples meals sitting on the tables waiting for them to arrive which we didnt like the thought of. Being All Inclusive was great for during the day - especially when sitting by the pool and wanting drinks. They also did snacks and ice creams but only during certain times. The only other disappointing thing was we didnt meet our holiday rep until the last day. We survived ok without him but it may have been nicer if we had found him before. He was only present in our hotel for about half an hour a day. We did go to a welcome meeting which was in another hotel so did get told all the information we needed to know. Probably the most important thing we were told is that Bulgarian people nod there heads the opposite to everyone else which was a bit odd. Shaking your head from side to side meant yes and up and down meant no! ODD! All in all it was a good holiday and a nice hotel. The entertainments team put on various pool activities including water aerobics and water volleyball. Although Bulgaria doesn’t seem to be attracting that many English at the moment, most of the hotel staff spoke a reasonable degree of English. The children’s entertainment was mostly done in German or Bulgarian but I think there may have only been three English families in the whole hotel. There wasn’t much in the way of evening entertainment for adults in the hotel which was a bit disappointing as we were all inclusive and enjoyed drinking in there bar even if the local spirits drinks were extremely strong. Saying this bar staff were happy to give smaller measures for the non-hard-core drinkers like myself. The buffet style food was good. Although some things looked a bit strange, most was labelled and tasted quite good. There was always plenty of salads and anti-pasta. Breakfast wasn’t a typical 'English Breakfast' but close to it with fried eggs, fried bread, sausages, tomatoes etc. There was always cereal, yoghurts, breads and various 'cakes' too as well as teas, coffees, juice etc. For Lunch and Dinner there was always a selection of meat cooked in various ways, two types of pasta and sauces, and choice of potato's including chips at lunch time. The desserts were various cakes, which were fab, ice creams and fruits especially melon! One lunch time I think we saw them bring out ten huge water melons in the space of half an hour. There were three restaurants which could have been booked to eat in. We didn’t do this because you had to order your food the day before and we did see as we walked past one night peoples meals sitting on the tables waiting for them to arrive which we didn’t like the thought of. Being All Inclusive was great for during the day - especially when sitting by the pool and wanting drinks. They also did snacks and ice creams but only during certain times. The only other disappointing thing was we didn’t meet our holiday rep until the last day. We survived ok without him but it may have been nicer if we had found him before. He was only present in our hotel for about half an hour a day. We did go to a welcome meeting which was in another hotel so did get told all the information we needed to know. Probably the most important thing we were told is that Bulgarian people nod their heads the opposite to everyone else which was a bit odd. Shaking your head from side to side meant yes and up and down meant no! ODD! This was my 23rd trip to Bulgaria and my worst holiday ever .Imay add our first holiday at all inclusive basis. This hotel was 3 star hotel so they say .our first problem was with the room right on the main road it was like living on the side of the M 25 trafic day and night we aked to be moved as we had asked foor quiet rooms we found the staff very unhelp full on this and asked them could we pay extra for a sea view room the reply was no ,by the way if you have booked a sea view room you cant see the the sea because of the hight of the sand dunes.Now the drinks all drinks are watered down even the beer which the bar staff told us was true.The wine was served from a 2 ltr oil bottle not chilled also with added water. The food was edable but undercooked pink chicken and all food was cold or luke warm and would not pass U.K food and hygine standards,if you was late for meal times ie,dinner was 6pm till 9pm at 8.20 they start clearing the food away and once the sweets had all gone they was not replaced . After 4 days of this we ate and drank out so in our cases not a good and would not reocomend this hotel to anyone. I went to this hotel hoping for a great family holiday instantly arriving in the foyer/reception we knew it was a bad decission , We were greeted with guten tag to which we replied we are english , they looked at us in disbelief . We were then after 20 minutes wait taken to our room which was like a sauna due to no air con the view was probably the only good thing if you wanted to feel like you were in prison . After dropping our suitcases in our rooms we went for dinner , everthing was labelled in German and looked like stew/slop it was warm but not hot lots of veel and more veel with 1 dish of chicken stew . Dinner was rather uncomfortable as we were being looked at constantly by the German families in the hot not air conditioned restaurant . We all left dinner hungry and went out of the hotel for food , we then after a walk returned back to the hotel for drinks and entertainment which was comletly German orientated . we arrived at the hotel about 6am and were taken to our room straight away, our room was very clean and the bed was so comfy, we had air conditioning which was great, you have to make sure you book rooms with air con as only half have it! Pool area is well maintained and lovely big pool, no extra charge for sunbeds or brollys and you can still go down at 10am and find a sunbed. Breakfasts were lovely lots of choice, we didnt have any complaints about the food there,s always plenty of choice and if you dont like the main meals theres always plenty of salad/chips etc, food was hot. Snacks during the day were always hot dogs, salad rolls if you went early, but think snacks mainly for the kids. Bar was unlimited drinks and always served quickly the barmen were really friendly and funny. The hotel does cater more for Germans probably wouldnt suit anyone going with kids as the kids club is in german. Great hotel and we,re hoping to go back next year. The hotel is exceptionally clean although our room was only cleaned every couple of days. The food was ok but some days did look like the remnants of the day before with alot of salt added to try and disguise the fact, and did appear to cater mainly for germans. The location was good and just a 2 minute walk to the beach. Some of the staff didnt seem interested but the ones that were, more than made up for that. Especially the bar staff who were always polite and up for a laugh. It definately is not a place to go on a family holiday unless your children are fluent in german as this was the only language spoken by the kids club entertainers. Even though I have put I wouldn't visit the hotel again, I would if the price was right, just to use as a base due to the location of the beach, taxis, restaurants, bars and shops. The hotel was very clean and our maid cleaned the room every day and we had fresh clean bed linen and towels (if not) every day then every other day. The pool and pool area was extremely clean and the staff maintained tidyiness throughout the day. All the eating areas were clean and the main restaurant staff were efficient at clearing tables - we only had one breakfast time (at about 9.15am - late for us) when there was no room either inside or on the balcony (which isn't bad considering we were there for 2 weeks). There was a variety of food available and there was always something suitable - albeit pork is off the menu here at home for some time! Having said that, it is quite clear that hotel food in Bulgaria does tend to be more appreciated by our international friends ie. hams/cheeses/frankfurters ... Maybe I could go out there and be a food consultant (ha ha). The bar staff were friendly and helpful and worked long hours and were always pleasant even when they were off duty. The bar, lounge and outside seating area was clean and tidy at all times. The toilets in the public area were exceptionally clean, although I would have expected some toilets downstairs near the pool area. The entertainment staff did not speak English and therefore any young English children weren't able to join in with the daytime childrens activities, likewise at night, the shows they put on were in German and we felt a little bit left out to a certain extent .. even in a morning their announcements of activities for the day were in German. The hotel was in an excellent position, close to the beach, shops, bars and restaurants. Our rooms were excellent. We overlooked the pool and had no stairs to climb! Food was mainly pork, spam and frankfurters. Waste of money paying for all inclusive when the local restaurants and bars are not only much better food - but very cheap. Food not hot - but that is to be expected as warmer countries tend to eat food cooler than us Brits, there is a microwave available if you want your food hotter. Main problem with food is that it targets a German pallette and gets very boring after a few days - most meals, the choice is very similar. "Main restaurant" is more like a canteen where you not only have to collect your own food, but your cutlery as well. The all inclusive attracted families (most parents careless about whether their kids are disturbing others, so long as they didn't disturb them) or groups of men/teenagers there for the cheap booze. Entertainment geared to German Tourists. English invited to Darts,volleyball and bingo - woopeee!! Hotel is to South of resort, near enough to walk into centre but there will be plenty of bars and shops around once resort starts to open for the season towards the end of May. Lots of new hotels being built. There are no Park views to go with the air conditioning. Air con was also a waste of money in May. Found the locals very nice - but watch the taxi drivers - don't get in until they have agreed your price. Then try and have the right money ready.